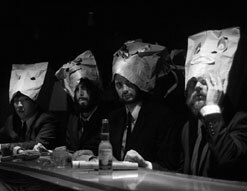 In the video for “Hope Is A Butterfly, No Net Its Captor”, the four members of RX Bandits play a gang of corporate (or at least well-dressed) thieves on a rampage, holding up average citizens for their money — and worse. The trunk of their vintage Camaro is jammed with their booty: solid-colored geometric shapes pilfered from the old and young, rich and destitute alike. Remorseless, they shake down unsuspecting citizens, tossing their ill-gotten gain into the back of the car. It isn’t until the end of the video that the thieves remove their paper bags and we understand what they’ve really stolen — the souls and spirits of their victims. It’s a suitably irreverent clip, action-packed and frequently funny, especially when the thieves meet their matches on a kid’s playground. Its freewheeling tone perfectly matches “Hope Is A Butterfly, No Net Its Captor” — an explosive song even by the kinetic standards of the RX Bandits. “Hope Is A Butterfly” is a standout cut from Mandala, an album that Sputnik Music calls “a developed, fully matured hybrid of different elements of progressive, ska, reggae, and rock.” This spring, they’ll be taking that sound worldwide, touring England and Western Europe before returning home to California for further adventures. They’ve been expanding minds wherever they go, turning rock clubs worldwide into laboratories for their stunning, audacious fusion of popular forms. We’re excited to bring you this exceptional new video and it’s our pleasure to be working with our friends at Sargent House once again. If you need more info, call Andy Gesner at 732-613-1779 or e-mail us at info@HIPVideoPromo.com . You can also visitwww.SargentHouse.com to find out more about RX Bandits.